Along with a cadre of stellar design professionals, educators, communication gurus, and experts in social enterprise, Peter Durand of Alphachimp served as faculty and scribe for this amazing weeklong program. Each year, PopTech selects 10-20 high potential change agents from around the world who are working on highly disruptive innovations in areas. 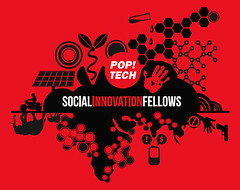 The PopTech Social Innovation Fellows Class of 2010 includes the best and brightest minds working the fringes of material science, conflict resolution, citizen science, global health delivery, mobile technology, science education, rights advocacy, recycling, micro-finance & micro-insurance, and micro-hydro and solar energy for the rural poor.